I often see people come in to the gym and without any hesitation go over to the bench press or squat rack, throw on a bunch of weights, and start their workout. This may seem like the logical thing to do for most gym goers, besides that's what you are going to the gym for right, to "lift weight". Although this is true, a proper warm up can provide huge benefits; such as warming up your core temperature, preparing your central nervous system, and activating the muscles you'll be working that day. A proper warm up should last for at least 10-15 min., and include some foam rolling, dynamic stretches (aka: movement prep), and a few full-body movements of the workout exercises or ones similar to the workout for that day. For instance, your movement prep should be specific to what you will be working that day. It should vary depending on whether you will be working on speed work (sprints) or upper/lower body lifting. Then grab a foam roller and roll out the following areas 6-8 times each. Foam rolling is basically a self massage, and the purpose is to create some elasticity in the muscles and break up any tension that might be in those areas. Doing these will reduce your risk of injury and improve your performance. Here are some of my favorite movement prep exercises that EXOS (formerly Athletes' Performance) uses. Others can include karaoke, lateral shuffling, and jumping jacks/jump rope. These should be specific to your workout exercises or very similar in movement. A simple rule of thumb when lifting weights is to perform movements in all planes of motion. So here are some good exercises to help prepare your muscles for lifting. Keep in mind that if you are going to be performing big compound moves (Barbell Squats, Deadlifts, Barbell Bench Press) you may want to spend even more time doing some warm up sets of each specific exercise. Use light weight and do 1-2 sets of 10-12 reps each. For this week's row machine workout, you will be working just below your lactate threshold; the point at which you begin using stored glycogen (carbs) rather than fat for energy. Once you go over your threshold you start working anaerobically and will be limited as to how long you can maintain that certain pace. You CAN, however, improve this through proper training. For this row workout, you will be working hard but not too hard. If you want to use HR as a guidance, think of staying between 80-85% of your max HR. 10-15 min either on or off the rower doing some light stretches or dynamic movements. Then spend 3-5 minutes on the rower doing a few short bursts (20-30 sec) of a higher intensity followed by 40-60 sec of easy rowing. Try to match your time for each 1000m interval. Then the next time you do this workout, see if you can beat the old time for each interval. This past weekend I participated in the Warrior Dash (WD) Washington event held up in Bonney Lake, WA and qualified for the WD World Championships. Warrior Dash is hosting the Obstacle Course Race World Championships in October and is offering up $100,000 to the Top 3 Elite men and women. That's pretty motivating to train hard and do what I love to do, compete. In order to be able to compete in the World Championships, you must qualify at one of their events and finish in the top 25. Since there are only two Warrior Dash events in the Northwest (Bonney Lake, WA and North Plains, OR)) I decided to head to Washington and try to qualify. Another motivating factor to compete in Worlds is that Anytime Fitness is one of the Official Sponsors of the Warrior Dash events. Anytime Fitness has so generously supported my efforts to compete in the World Championships this year. It will be such as huge honor to represent Anytime Fitness at the World Championships by promoting a healthy lifestyle through overcoming obstacles...literally. Oh, and it would also be sweet to take home the top prize of $30,000. The WD race this weekend in Bonney Lake was not too difficult compared to others I have participated in. Covering a 5k course and including only 12 obstacles I figured to take about 22-25 minutes. The course was located at the Kelly Farms and the terrain was mostly on rough grass and wooded/rooty mud. A light drizzle and cloudy skies kept the temperatures in the high 60's at the start but it quickly warmed up throughout the race. The first mile was all running, on grass, sand, gravel and mud. After a couple obstacles to break up the rhythm, we had another long section of running. I mistakenly made a wrong turn after the 3rd obstacle allowing 4 racers to get ahead of me. I was able to pass one of them but couldn't quite catch the other 3. Dumb mistake that hopefully won't happen at Worlds. We then ran through a singletrack section in the woods that consisted of lots of roots (I even got stung by a bee) and then more wet grass before reaching the meat of the obstacles. There were about 6 obstacles in the final 1/2 mile. Neither of them was too difficult except the cargo-net tunnel obstacle was a bit tricky. I'm not sure of my official finishing time; they don't do timing but instead just place the top 25 finishers in order. I finished 8th overall and I believe in a time of around 24:30. If I hadn't made the wrong turn I probably would have finished 5th overall and right around 24 minutes. I collected my medal and accomplished the goal of qualifying for Worlds. Now it's time to focus on hill running for the next 2 months. I believe the course for Worlds will be quite challenging on very hilly terrain down in Esparto, CA. I wanted to remind everyone of the Decathlon Fitness Challenge I will be hosting at Anytime Fitness on Wednesday July 23rd at 6pm. It's open to any Anytime Fitness Member and any non-member who comes in for a FREE Trial of the gym. If you are in town on vacation, or visiting for work, stop by Anytime Fitness located on Simpson Ave next to Subway and take a shot at winning this Challenge. And in case you forgot, there will be a $175 prize offered to the winner. I would like to share two very healthy and amazingly tasty recipes with you that involve using quinoa as the main ingredient. Quinoa can be a great substitute for rice or oatmeal, and can also make for a great side dish with your next salmon or chicken dinner. These two recipes are great for a breakfast or a snack during the day. The first one I have personally made for breakfast and is a simple way to eliminate using any kind of flour. Don't be fooled, they taste awesome. So, if you are looking for a gluten-free option, this is also great for those who are gluten intolerant, and we all know there are lots of those these days. The second recipe can make for a great healthy snack. Combine all ingredients in a large bowl until mixed well. Heat a skillet on medium heat and add some coconut oil. Pour batter into pan to make 4" diameter pancake, (add frozen blueberries), and cook for 2-3 minutes on one side. Then flip and cook another 1-2 minutes on other side. Serve with fresh blueberries and maple syrup. 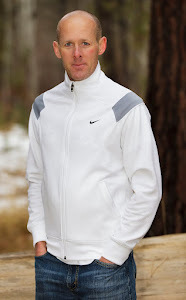 Next week on Wednesday July 16th, I will be doing a Decathlon Fitness Challenge at Anytime Fitness in Bend. The challenge be a twist on the traditional Decathlon event. It will, however, consist of 6 exercises (hence the "decathlon" part) and will test your strength and endurance through weight room exercises. The challenge is open to men and women and anyone who thinks they have what it takes to out perform their peers. You'll definitely need to bring your "A" game. I will be offering a cash prize of $175.00 to the overall winner. The event will take place Wednesday July 16th at 6pm. Here is another row machine workout you can do to help boost your Vo2. This is one of my favorites because the distance is not too long allowing you to still go hard without completely destroying yourself. The rest intervals are short so it doesn't allow for full recovery but enough time to catch your breath and prepare for the next hard effort. Row 1000m hard, then row easy for 1 min. Then repeat this two more times for a total of 3 sets. I have been asked by a few people lately what I do to train for an obstacle course race (OCR). 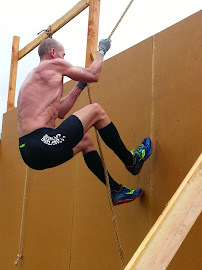 So, in this post I will share some of my training workouts that I do to prepare for OCR races and a video to help give you an idea of the intensity involved. Since most obstacle course races consist of 3-5 miles (some cover up to 13 miles) plus 12-24 obstacles I don't spend too much time on my steady state endurance. I don't go out an run easy for miles and miles. Instead when I do my "long run" (usually only 5-6 miles) I incorporate several exercises along the way to break up the feeling of getting comfortable. I have only done one race (Tough Mudder Oregon) where there was any length of running over 1 mile. I train 5-6 days a week with at least 1-2 days of rest. I break up the week by doing "race simulation" workouts, strength workouts in the gym, track workouts, and obstacle training. My obstacle training involves heading down to a nearby school and playing on the equipment; usually this will include monkey bars, balance beam walks, parallel bars, log hops, some pullups and jumping pullups, and jumps over a gate. When I go out for my long run I usually will include some burpees, lunges, squat jumps and mtn. climbers every 10 minutes. Keep in mind that i am not doing these exercises at 100% but I am also not lollygagging. My goal is to simply break up the running rhythm and stress the body to the point where it becomes a little uncomfortable. Most obstacle course races occur on hilly terrain so running hills is a regular part of my training. Again I don't do any long hill repeats but lots of short steep repeats, or run on a course that has many ups and downs over the course of the workout. As for the strength training that I do, I will do 2 days a week with each lasting about 1-1.5 hours. I really try to keep my body under stress the whole workout, so I will occasionally wear a weighted vest (15lbs). This helps to build functional strength since the weight is on my body rather than being held in my hands. Moving your body up/over/under things becomes much easier when you're accustomed to moving more of your own weight on a regular basis. I do anywhere from 3-6 sets of each exercise, usually based on time (30-60 sec) rather than reps, and keep rest periods minimal. I'm not trying to bulk up, so I don't need to take 1-2 min rest periods after sets. Here is a list of exercises (and a video) that I regular do when strength training for obstacle course racing. In this workout I do the Deadlifts and Man-Makers for reps (8) while the rest for 45 sec each; except Power Jacks which are only 30 sec. I try to keep these as powerful as I can in 30 sec. I do 4 sets of everything and keep rest between exercises and sets minimal. This workout will challenge your aerobic and anaerobic capacities. Start by warming up for 10 min. (either on or off the row machine). The goal here should be to get your body temp up and increase your muscles elasticity. Set the level of resistance to 10 on your machine. You are going to Row for 3000m total, but rather than stay at a consistent speed, you are to change the SPM (strokes per minute) every 500m increasing by 4 spm's for the first three and then reducing by 4 spm's the last three efforts. So here is how your workload should look. Keep in mind that each machine's SPM will be slightly different. The when you are finished do some sort of cool down; consisting of either easy spinning on a bike, stretching or foam rolling.